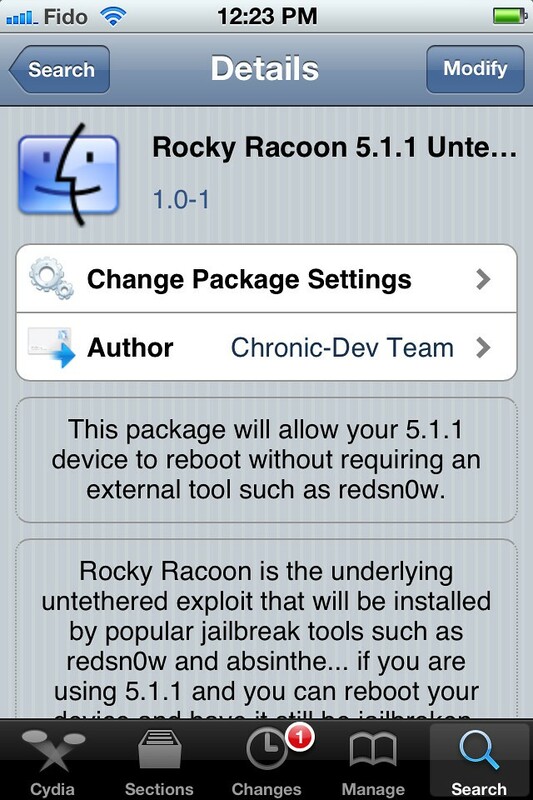 The Chronic Dev-Team has released Rocky Racoon 5.1.1, a package in Cydia that will untether your device if it is currently running a tethered jailbreak of iOS 5.1.1. Rocky Racoon is the underlying untethered exploit that will be installed by popular jailbreak tools such as redsn0w and absinthe... if you are using 5.1.1 and you can reboot your device and have it still be jailbroken, you have Rocky Racoon. If you device relies on Rocky Racoon for untethering, which includes nay iPad 2, iPad 3, or iPhone 4S running 5.1.1., uninstalling this package will unjailbreak your device. You can install Rocky Racoon from the System section in Cydia.